This is not a Black Edition Nissan GT-R. Don't let CNBC fool you. CNBC rates the 10 fastest cars of 2011, and picks the 2012 Nissan GT-R for the top spot. However, like a lot of non car related people, talking about cars, they get the technical information wrong. 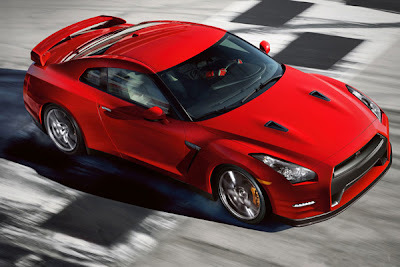 For 2012 there are two trims of the Nissan GT-R, a Premium and a Black Edition. Other than the wheels, which are slightly lighter on the Black Edition, there is no performance advantage over the Premium. However for 2012, the power increase to 530 hp, and new launch control get the car into the low 3 second range to 60 mph. "Previous models since 2009 have gone from zero to 60 in 3.6 seconds, but the Black Edition does the job in 3.1 seconds, earning its place at the top of this list. " So perhaps the point is, you should take what non car people say about cars with a grain of salt. Even Dan Neil from the Wall Street Journal, and now the Car Show got his information on the 2012 Nissan GT-R very wrong in his article. I wondered if he had even actually driven it, rather just collected information from other sources on the internet.